The Dominican friars of St Martin de Porres (USA)! The Pharisees and scribes—finally fed up with Jesus' teaching and disruptive behavior—ask Jesus a straightforward question: “By what authority are you doing these things?” “These things” includes using a whip to clear the temple area of moneychangers. Why would his enemies care by what authority he causes a near-riot in the temple? It would seem that Jesus' behavior alone is enough to discredit him in the eyes of the crowd. So, why ask about his authority? There is a long history among God's people of prophets being sent to straighten out the messes caused by the ruling religious elite. The Pharisees and scribes do want to discredit Jesus on religious grounds, but they also want to make sure that he's not a real God-sent prophet. They both want to know and do want to know who he is. This ambivalence leaves them teetering btw action and inaction, btw their religious power and the anger of the crowd. When challenged by Jesus with a simple question, the elites fall back on a time-honored political dodge. They answer, “We don't know.” They do know! But they don't answer b/c the consequences of doing so are just too much to bear. For us, “we don't know” is never an answer to the question of Jesus' identity. He is the Christ. Then, now, always. The Pharisees and scribes claim not to know whether or not John's baptism is of divine origin. Maybe they don't know, strictly speaking, but they do have an opinion on the question. But because they are afraid of the crowd and even more afraid of who Jesus might be, they claim ignorance. This is a dodge pure and simple. You can almost hear the groaning and jeering of the crowd when they start to bob and weave. We can guess is Jesus is pleased with this dodge b/c he's not yet ready to fully reveal his identity. Their “we don't know” allows him to dodge their original question, thus preserving the Messianic secret for a while longer. That secret—that Jesus is the Messiah—has long since been revealed, so we cannot honestly say, “We don't know by what authority Jesus did all those things.” By what authority did he teach, preach, heal, admonish; by what authority did he choose the apostles, commission them, send them out; by what authority did he establish the Church, invest her with his own authority, and preserve her from error? We can't say that we don't know. We can't safely dodge these questions. There's no crowd waiting to riot if we answer incorrectly, but there is the sin of deceit and the possibility of scandal if we start to bob and weave. If Jesus is who he says he is—and he is—then certain truths follow naturally from this single truth. If Jesus is the Christ—and he is—then the Church is his body working in the world; Francis is the successor to Peter and Christ's steward on earth; the Church mediates divine grace to her members; all the baptized are each a priest, a prophet, and a king; the Eucharist is true food and true drink, and so on. In other words, the truth of everything we believe about ourselves as Christians rests on the question of Jesus' true identity. So, why would we ever hesitate to loudly proclaim that Jesus is the Christ? Like the Pharisees and scribes, we face popular pressure; threats to our own identity; threats to our need for control; pressure from elite factions of our country and culture; we may even feel pressure from within the Church to bob and weave when applying the Gospel to contemporary problems. Remember the Pharisees and scribes: they are ambivalent, teetering btw truth and fiction, left dangling with nothing but their naked pride showing. Our yes must yes and our no must be no. There is no maybe in preaching the Good News. Either Jesus is who he says he is or he isn't. If he isn't the Christ, then why are you here? If he is, then shout that Good News from the rooftops and make known the saving power of God! [Theological modernism] was little more than the result of a rather puerile desire of Christians, especially clergymen and theologians, to avoid being counter-cultural, to retain the same status and “relevance” in a secular age as had been accorded them in a Catholic age. Therefore, by the mid-20th century, Modernism had become the quasi-spiritual and theological doorway through which a profound secularization entered into the Church, as Catholics at every level embraced the opportunity to reinterpret their faith and values in ways which made them more compatible with the larger surrounding culture—a culture which was no longer shaped in any significant way by the Faith. The result was a rapid shift in Catholic sensibilities, beginning with a rejection of authority in favor of the zeitgeist (spirit of the times or cultural spirit). Where in 1930 parishioners would likely have been shocked if their priest undermined or contradicted a clear statement of the Holy See, in 1980 parishioners could very easily be moved to applaud the courage and vision such a contradiction seemed to them to embody. This broad infection of secularization in the Church led to countless abuses in preaching, in the liturgy, in catechetics, in theology classes, and even in social action and politics. In fact, as both the attitude of relativism and the power of the State grew during the same period, Catholics began to see things more and more in merely political terms. Every disagreement was understood to be essentially a partisan struggle. In some universities and religious communities, these attitudes continue unabated even now that dioceses and parishes have begun to heal. Efforts by the Holy See to correct the wayward are a perfect example. The Holy See inevitably speaks in terms of the objective and absolute truths Divinely revealed through Jesus Christ, and the Holy See is inevitably dismissed as a bunch of old, celibate, white European males making a power grab for a party whose relevance has long since vanished from the world stage. Bartimaeus' blindness is healed, so naturally we assume that this gospel story is about a miraculous cure. In fact, Bartimaeus' healing is a story about discipleship, a story about being healed so that discipleship is possible. We know this b/c the Greek tells us much more than our English translation can. Mark tells us that Bartimaeus is sitting by the “roadside begging.” The Greek work for “roadside” is hodon. Once his blindness is healed, Mark tells us that Bartimaeus follows Jesus “on the way.” The Greek here is hodo. In other words, Bartimaeus, blind and pitiful, is sitting along side the way begging. Jesus comes along the way, heals Bartimaeus' blindness, and now he, once blind, follows Jesus on the Way, both enlightened and sighted. Other than the miraculous cure, what changes btw Bartimaeus begging beside the way and Bartimaeus following along behind Jesus on the way? Our Lord asks the blind man, “What can I do for you?” He answers, “Master, I want to see.” In his compassion, Jesus says, “Go your way; your faith has saved you.” What “way” does Bartimaeus choose? He chooses the Way of Christ. After healing Bartimaeus, Jesus tells the once blind man to “go your way.” His eyes are open now. He can “see” the truth. He can choose his own way and live life w/o begging. With all the options available to him, he chooses Christ as his way, the truth, and the life, giving his own life to the ministry of Christ by following him. So, yes, this is a story with a miraculous healing, but it is fundamentally a story about how a blind man comes to see by faith and answers the call to discipleship as a student of Christ. Like Bartimaeus, we are all called to discipleship. Every one of us hears a call to be a student learning at the feet of a Master. The question is: who do we choose as our teacher? The options are legion. We can be students of our rapidly collapsing Enlightenment culture; students of material science and the nihilism it imposes; students of our disordered passions and instincts; students of the created world, giving ourselves over to made-things rather than their Maker. We will learn from a Master, someone or something will teach us. The only question is: who will we choose to learn from? And make no mistake, we choose our teachers. We choose to submit ourselves to the lessons we learn. Bartimaeus chooses Christ with good reason. Why have you chosen Christ? What are your good reasons? We don't have to think too hard to understand why Bartimaeus chooses Christ as his teacher. Jesus tells his disciples to call the blind man over to him. They say to Bartimaeus, “Take courage; get up, Jesus is calling you.” But how did Jesus even notice the poor beggar in the first place? Over the racket of the crowd, Jesus hears the man calling him repeatedly, “Jesus, son of David, have pity on me.” Bartimaeus calls out to Jesus for compassion. Jesus calls Bartimaeus to discipleship by healing his blindness. That's a good reason to make Christ your way, your truth, and your life. What's your good reason? Why do we need a good reason to follow Christ? What's wrong with saying, “It's my choice! I don't need a reason”? For someone, you and I will become a teacher. You and I will be chosen as someone to follow. If we follow Christ, then we will naturally lead to Christ those who look to us for instruction. If we're to point to Christ as the Master, and not ourselves as some sort of guru, then we need a reason to be walking his Way. If we are no longer blind to the truth, who healed us and how? Make yourselves ready to give reasons for your faith. “As the rising sun is clear to all, so the glory of the Lord fills all his works. . .” You are among His most beautiful works. How will you reveal His glory if asked for the reason why? The pope cares for the poor and calls upon all Christians to assist them. This must mean that our Holy Father embraces liberation theology, right? I mean, only leftists really care for the poor! I’m afraid, however, that if one looks at Francis’s pre-pontifical writings, a rather different picture emerges. Certainly Bergoglio is a man who has always been concerned about those in genuine material need. But orthodox Christianity didn’t need to wait for liberation theology in order to articulate deep concern for the materially poor and to remind those with power and resources that they have concrete obligations to the less fortunate. From the very beginning, it was a message that pervaded the Gospels and the Church’s subsequent life. Calling All Catholic Education Nerds! Next semester I will teaching a course at Notre Dame Seminary called, "Teaching and Preaching the Word of God." The course is designed to teach seminarians who to teach the faith to children/teens/adults. The General Directory of Catechesis and the USCCB's United States Catholic Catechism for Adults will feature prominently, but we still need a good book or two on theory/method in faith formation pedagogy. P.S. Thomas Groome's work has been mentioned as a possibility. . .but I'm pretty sure his stuff (or some really bad uses of his stuff) has been partly responsibile for the collapse of good faith formation in the last 40 yrs. If we will be open to receiving all of God's gifts—not just the ones we see as personally advantageous—we will be slaves to all. We are given divine gifts for one purpose: to use freely for the benefit of others. And in using these gifts for others, we are perfected in His love. What are your divine gifts? First, you are alive. As a follower of Christ, your life belongs to God. Every breath, every heartbeat, every second of your existence is His. Second, you are a rational creature, meaning that you are made by God to think, to reason, to deliberate. By this gift you are freed from the prison of instinct and disordered passion. This allows you to use the gift of life to order your heart and mind toward service. Third, just as you were made by God to reason, you are re-made in Christ to love. Joined to Christ in baptism, you are a member of his living Body on Earth, a sacrament of human flesh and bone that presents God's mercy to the world. And, finally, because you are re-made in Christ to love, you can become Christ for others, re-making others in his love. If Christ came to serve not to be served, then those of us who hope to grow in Christ's perfection must serve. And to do this, we must be open to receiving all of God's gifts and using them for the good of all. For those of us who are lost, held captive to sin, and living in darkness, there is a way to be found, freed, and brought into the light. Sirach assures us, “To the penitent God provides a way back, he encourages those who are losing hope and has chosen for them the lot of truth.” God provides, encourages, and chooses. He provides the means for returning to Him. He encourages the weakened heart. He chooses truth and makes truth an inheritance. For whom does God provide, encourage, and choose? The penitent. Those who repent, those who turn from sin and disobedience and return to Him in contrition. Repentance is not a condition for mercy. There are no conditions for the gift of mercy. However, what good is mercy if it is not freely received? To receive God's mercy, to be open to making mercy work in the life of a sinner, the sinner must take what is given. But we cannot take a divine gift and put it to work in a soul that has turned away from God. So, we must repent, turn again toward God and His rule. Think for a moment: what prevents you from turning again toward God? What weighs you down, holds you under the thumb of sin? The rich young man—a figure both sympathetic and tragic—asks Jesus, “Good teacher, what must I do to inherit eternal life?” Jesus recites the Ten Commandments, knowing already that the man follows the Law dutifully. The man says, “Teacher, all of these I have observed from my youth.” Though he has followed the Law since he was a child, the man is still lost, living in darkness. And even though he's living in darkness, he longs to be brought into the light. This tells us that sin can never completely destroy our desire for eternal life, our hope of salvation. Mark tells us, “Jesus, looking at him, loved him. . .” Despite his sin, despite his attachment to things, Jesus loves him. Thus, Christ is the means that God provides for us to return to Him. Christ is the encouragement that God provides to strengthen our sin-weakened hearts. Christ is the choice that God makes for us to live in truth. The man is kneeling before Jesus the Teacher and he's asking to be taught. So, Jesus teaches, “You are lacking in one thing. Go, sell what you have, and give to the poor and you will have treasure in heaven; then come, follow me.” The man lacks for nothing in this world except the will to leave the world for heaven. 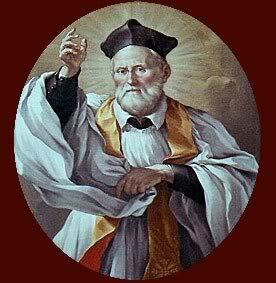 Happy Feast Day to all the Philip Neri's of the world! In the face of Mystery, we wait. . . If we were to wonder about the fundamental difference between scientists and believers, we could say that scientists work to expose the mysteries of the universe by use of reason alone, while believers—Christian believers—work along side mystery in reason and wonder to expose themselves to God and His handiwork. Scientists hope to learn more about the universe for the sheer delight of gaining practical knowledge. Believers hope to learn more about creation so that their joy may be complete by growing closer to their Creator. The fundamental difference btw science and faith hinges on mystery. For science, a mystery is a problem is to be solved. For faith, mystery is a truth not yet revealed. What we share with science is the alluring power of Not Yet, the seduction of knowing just enough to keep us motivated to learn more. When Jesus says, “I have much more to tell you, but you cannot bear it now,” scientists hear a challenge but believers hear a promise. The promise of the coming of the Holy Spirit is fulfilled at Pentecost. And with the coming of the Holy Spirit, God reveals the central mystery of the faith: He is Three in One. How to describe this essential mystery? We could say that the Trinity is like a single drop of water in three forms: fluid, frozen, vaporous. But the Trinity is Three in One simultaneously, while a drop of water cannot be fluid, frozen, and vaporous all at the same time. We could say that the Trinity is like a woman who is simultaneously a mother, an aunt, and a sister. But the Trinity is Three in One absolutely, relative only to one another, while a woman is a mother, an aunt, and a sister only in relation to her children, her nieces, and her siblings. We could say that the Trinity is like a person with three jobs: Creator, Redeemer, and Sanctifier. The Father creates; the Son redeems; and the Spirit sanctifies. That's not wrong as such but if the Three are One then all Three must each be Creator, Redeemer, and Sanctifier. You begin to see the problem, right? How do we describe what is essentially unsayable, indescribable? We know that God is Three Persons in One Divinity, but how do we make sense of this mystery? We wait. Jesus says, “I have much more to tell you, but you cannot bear it now. . .” He doesn't say that we can never bear all that he has to tell us; we just can't bear all the truth right now. So, we wait and trust and hold ourselves in hope that the fullness of this mystery will revealed when we are finally perfected. What do we do in the meantime? Between knowing the little that we know and knowing the whole truth, what do we do? Jesus reassures us, “. . .when he comes, the Spirit of truth, he will guide you to all truth.” If the Spirit of Truth comes to guides us, then we must make our ready to be guided. And how do we do that? Writing to the Romans, Paul, teaches: “. . .we boast in hope of the glory of God. Not only that, but we even boast of our afflictions, knowing that affliction produces endurance, and endurance, proven character, and proven character, hope, and hope does not disappoint. . .” As followers of Christ, we boast about both our blessings and our afflictions. We boast of our blessings to show the world the mercy of God. We boast of our afflictions to produce endurance, character, and hope. What we do btw imperfect and perfect knowing is live our lives in that sure knowledge that “the love of God has been poured out into our hearts through the Holy Spirit. . .” When our imperfect knowledge of God's mysteries fails us, love never will b/c God is love and He never fails. And that is the definition of hope: knowing that God never fails. He never fails to provide, to forgive, to honor His promises. We prepare ourselves to be guided by the Spirit by hoping, by accepting the truth that God will not/cannot fail us. If we accept this truth and live this truth, then we are living with God who is Three in One. We are living trinitarian lives. Since the first century of the Church, our ancestors made a distinction btw the theological Trinity and the economic Trinity. The theological Trinity is the Trinity as He knows and understands Himself. Reason alone cannot help us know or understand God as He knows and understands Himself. So, how do we know anything at all about the Trinity? Since all of creation abides in God, and we live and move and have our being in God, we can look to creation and see the Trinity's presence there. The Trinity works in creation, works through His creatures to reveal His truest nature. This is the economic Trinity. When we love forgive, provide, bless, create, trust, sacrifice, and bear witness to Christ, we manifest—imperfectly, of course—we manifest the Blessed Trinity. Each one of us is a sliver of the mystery that is the Trinity working in creation. Each one of us reveals how we are the Father's favored child, the Son's brother or sister, the Spirit's student and servant. Each one of us is a piece of God's peace, His assurance that all is well, that everything will always be well with Him. And we know that all will be well with Him b/c, as the Catechism teaches us, “The ultimate end of the whole divine economy is the entry of God's creatures into the perfect unity of the Blessed Trinity” (n. 260). The whole point of God's cosmic plan of salvation is to bring us to Him to live perfectly united in Him. Do we need a scientific understanding of the divine mysteries to be perfect? No. Besides, science cannot perfect us. Do we need to work along side the divine mysteries in wonder and reason in order to be made perfect? Yes. B/c we cannot be made perfect, we cannot be brought to God w/o our consent and help. Mysteries of the faith—like the Trinity, the Incarnation, the Resurrection—are all revealed truths that we do not yet fully understand. We know that God is Three Persons in One Divine Being. We know that Christ is fully human, fully divine. We know that Christ was raised from his tomb body and soul. And we even have some inkling of what these mysteries mean to our daily lives as followers of Christ. What we don't yet know, what we cannot yet bear, is the weight, the fullness of these truths completely revealed. For that we must wait to see God face-to-face. And to see Him face-to-face, we must submit to the guidance of the Holy Spirit.